Jasmine Lake, Garden City – Looking for your own private upscale villa. When you see this you will say wow, with all the tons of upgrades,you will not find a nicer first floor water view condo on the beach.Maple sage color wood floors through out the kitchen, dining,living and bedrooms. Master bath has Bucak Medley walnut travertine floors with porcelain tile custom shower.Guest bath and entrance foyer, and laundry room also has the porcelain tile. Upgrade custom bathroom vanities in both baths.Master shower has two shower heads. Canyon Sunset granite with ogee cut in kitchen. Recently upgraded range and fridge.Up grader shelving, in all closets and master walk in. Custom mill work wood door casements, and crown molding, baseboards. Jasmine Lake is a small community of 135 units and first floor are in high demand, and this one has one of the better views, complete with custom privacy screening.Low Monthly HOA ( $224 ) includes the hazard insurance, cable TV, lawn upkeep, building upkeep, pool.Well managed HOA.Owner is a license REALTOR IN THE STATE OF SC. A must see for anyone looking for something very special. 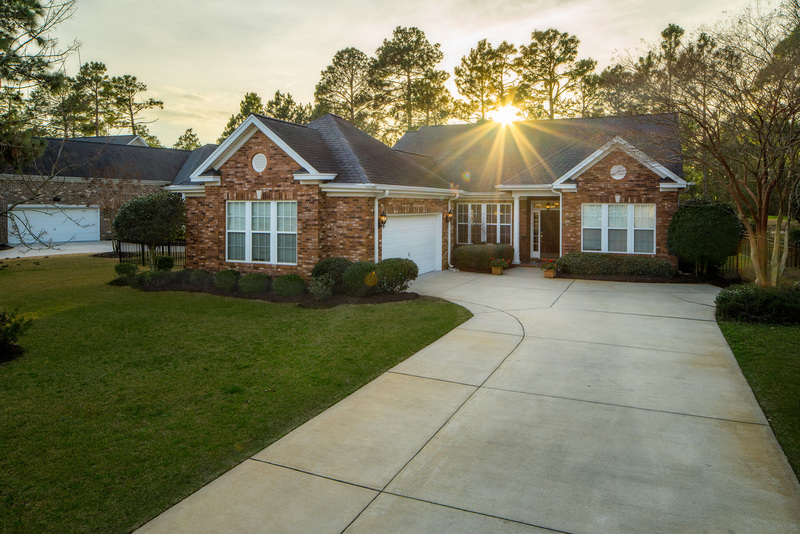 Sago Plantation, Myrtle Beach – Ever so often a special house comes on the market for sale, and now is that time. This home located at Sago Plantation was a model for several years and the home site selected by the builder was top notch,mature lanscaping in place and its superb vast water views on two sides of the home site, you will feel your on a island. The house foundation was also raises several feet to obtain even better views, giving the house a very stately look and drop down terrace feel. This home has 3 bedroom 2 bath first floor and the second floors yields a wonderful fourth bedroom suite with a full bath, walk in closet and a large balcony overlooking the vast water views. The home has wood floors throughout the living / dining and kitchen plus a lovely cottage feel fireplace with built ins cabinets / book cases on each side of the natural gas fireplace. The open kitchen with its large breakfast bar and island is truly wonderful for anyone wanting to entertain their guest . The bedrooms are split with the master taking up all of the left side of the home. The master also has french doors that lead out to the outdoor lanai, that runs the length of the back of the house.Come see what makes this home so special located within one Myrtle Beach best natural gas gated communities. Turnberry Park The Legends, Myrtle Beach – een waiting on a special vacation condo to come on the market, this two bedroom two bath fully furnished 1100 sq ft condo located at the Gated / Golf community Legends Resort has it all, best views, best location. Recently improved upon with new hot water tank, HVAC system and windows. The Furnishing are in great shape, and with 2 double beds in each bedroom accommodation for 4 people is no problem.What makes this villa so special is just not the furnishing but the views, Out the front you have the views of old Scottish Legends main golf club house , the 30 acre practice range with the golf school and the first hole of the parkland course. Out back you have the second hole looking straight down the fairway and water views. Plus you are within a few minutes of the Ailsa Pub which is open 7 days a week. For those owners who wish the Legends Resort Also offer a rental division that offer rental income through the year, what a great way to help offset the expenses of second home ownership. The Legends has 3 golf courses on location and is just 6 miles from downtown Myrtle Beach. Close to the airport, beaches and shopping. Sago Plantation, Myrtle Beach – Looking for a home site that offers all the features you wanted ,all wrap into one great home site. This natural gas gated community is located just outside the mandatory evacuation zone and this location does not require additional wind and hail insurance policy, as well no flood plain. Easy access to Carolina Forest Shopping with one stop light to a brand new publix grocery store, krogers and multiple restaurants. Sago Plantation is also within 1 mile of the world known Legends Golf Resort. Memberships are available to Sago owners as well. Want to go the beach, 6 miles and you are downtown at the beach. Choice of builders or if you elect to take your time, theirs no time frame to build. Come see what makes Sago Plantation so special, Great looking community with 50 new homes built over the past 3 years.